Regardez! 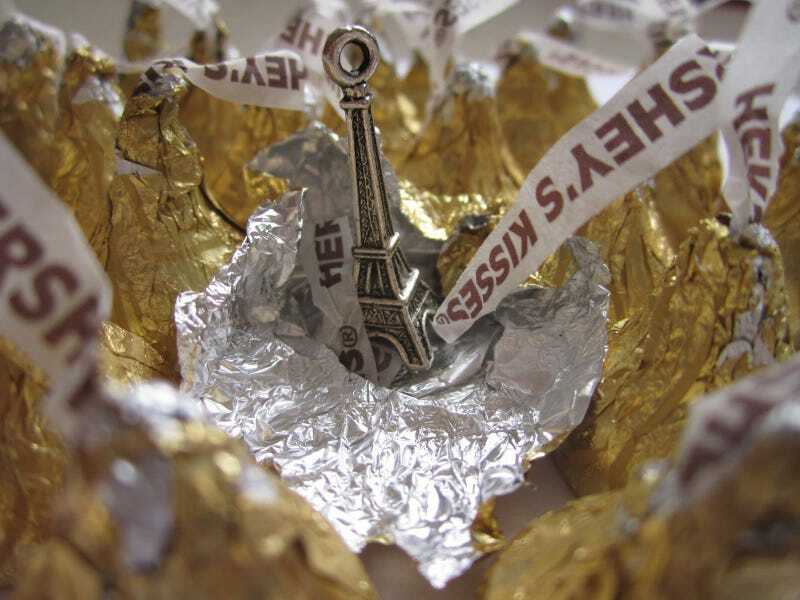 C'est un baiser de Hershey! En français! C'est pourquoi il est un baiser français! Todays request comes from dan7gtar. And, if you're particularly dense this morning, the subject it: the french kiss. Anyway, The french kiss. The origin of kissing is fairly well understood. What we don't understand, however, is when it evolved into something that is considered romantic. Way back when, in the long, long ago, in the before times, man had a limited diet. And the foods he had weren't exactly baby friendly. While breast feeding did take place, prehistoric babies did need to be weaned. And then they did need to eat. And most small children don't have teeth that can handle the tearing and chewing that comes with the diet of the time. How was that obstacle overcome? The same way a lot of species still do it today; the mother chewed up the food and then transferred it to the child, mouth to mouth. And, while the mother was transferring the food to the child, she would use her tongue. There was a lot of tongue on tongue contact between mother and child. At some unknown time, the kiss became a way for partners to express affection. Using the tongue was usually reserved for the really romantic occasions. In fact, the Kama Sutra describes a position called "Fighting Tongues". Europeans were more prone to using the tongue in their kissing. For a while it was known as a 'Florentine Kiss' because it was popular in Florence Italy. It was during World War One that American soldiers saw French soldiers kissing their partners in this method. And, some experienced themselves by getting friendly with the locals and the professionals. So, there you have it. The origin of the french kiss. Anyone hungry?